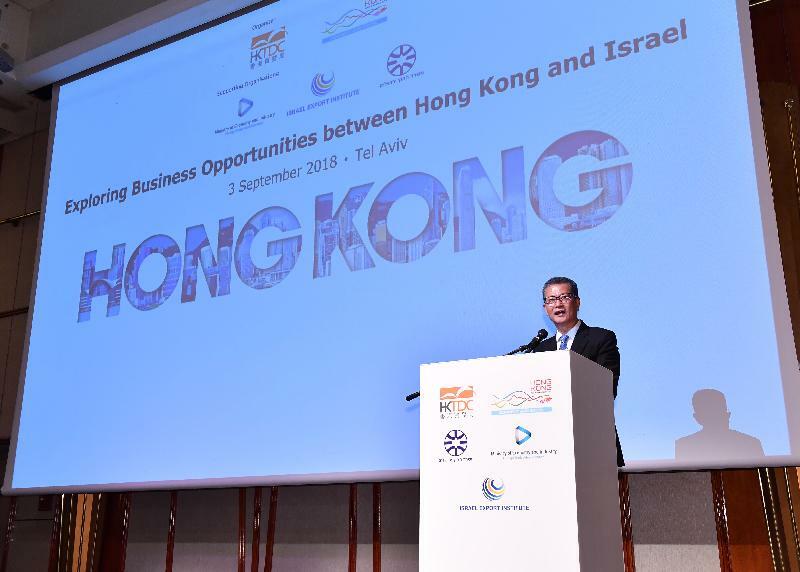 Following is the speech by the Financial Secretary, Mr Paul Chan, at the Hong Kong Business Luncheon jointly organised by the HKSAR Government and the Hong Kong Trade Development Council in Tel Aviv during his visit to Israel today (September 3, Israel time). I am delighted to be here in the ingenious and spectacular city of Tel Aviv, and to have this opportunity to break bread with our friends here in Israel. This is my first official visit to Israel and the first high-level official visit to this country by the current-term Government of the Hong Kong Special Administrative Region (HKSAR). So we are not only breaking bread, we are breaking new fertile ground for relations between Israel and Hong Kong. First of all, I thank our Israeli friends for the warm welcome extended to us. I also thank the Hong Kong Trade Development Council (HKTDC) for co-organising this luncheon with the HKSAR Government. We are delighted to lead a delegation to Israel, comprising established business leaders as well as burgeoning startups in Hong Kong. They include venture capitals and corporate investors, as well as companies focusing on financial services, Fintech, smart city development, biotech and biomedicine. We also have representatives from the Hong Kong Science and Technology Park and Cyberport, the two flagship institutions championing innovation and technology development in Hong Kong. Also here today are my colleagues from Invest Hong Kong, whose mission is to attract and facilitate Israeli companies to set foot in Hong Kong. I hope you will agree that, when it comes to breaking new ground for business opportunities, we have all the key players around the table. And thanks to Dr Appelbaum’s insightful briefing earlier today, bringing us up-to-speed on the latest development in Israel, we are now very aware of the opportunities ahead. While Hong Kong and Israel are miles apart geographically, we share much in our change-embracing can-do entrepreneurial spirit. In this ever-evolving global economic landscape, Hong Kong and Israel can be each other’s trusted partner in seizing the opportunities ahead. We are therefore here today to explore new avenues for collaboration with Tel Aviv and with Israel to help create a brighter and, of course, smarter future. Hong Kong is on the doorstep of the most prosperous region of Asia. From Hong Kong, you can reach half the world’s population within a five-hour flight. With our long-standing position as a pivotal gateway connecting Mainland China and the rest of the world, Hong Kong is certainly an ideal springboard for Israeli companies looking to develop and strengthen their presence in our region, and especially in the Mainland of China. Hong Kong also enjoys unique advantages under the “one country, two systems” arrangement, which allows us to maintain our own economic and legal system while being an integral and closely connected part of China. Flying the flag of free trade and upholding a level-playing field, Hong Kong has been widely recognised as one of the best places in the world to do business and we have been ranked as the world’s freest economy for each of the past 24 years, according to the US-based Heritage Foundation. On top of our free and open economy, we offer an internationally competitive tax regime, with companies paying no more than 16.5 per cent profits tax. In fact, this year we introduced a new two-tier tax system, by which the tax on the first HK$2 million (US$255,000) of profits is taxed at just 8.25 per cent. There is also no inheritance tax, no capital gains tax and no sales tax in Hong Kong. All this adds up to more money and more time for companies to invest in growing their business. Regarding our legal system, Hong Kong’s mature common law system and fine tradition of rule of law mean that entrepreneurs can rest assured that contracts will be honoured, intellectual property is well-protected and disputes are settled fairly. Arbitral awards made in Hong Kong are enforceable in over 150 Contracting States to the New York Convention. This is complemented by reciprocal arrangements with Mainland China. As one of the world's leading financial centres and China's international financial capital, Hong Kong is the ideal platform for fund raising. In terms of IPOs, Hong Kong has been ranked number one globally for five years in the past nine years. Our deep liquidity, premier financial infrastructure, and comprehensive options for raising capital can meet the varying financial needs of different types of businesses, tech companies included of course, whatever their size and whatever their stage of development. Hong Kong also enjoys first-mover advantages available to no one else, in leveraging Mainland China’s continued economic development. We are now the global offshore Renminbi (RMB) business hub with the world’s largest offshore pool of RMB funds. Through Hong Kong, international investors enjoy access to a wide variety of RMB products, including bond issuance, trade settlement and RMB denominated banking. With the launch of Bond Connect, Stock Connect schemes, and mutual recognition of funds arrangements between Hong Kong and the Mainland, Hong Kong serves as the unique two-way portal connecting international and Mainland investors to each other’s vast market. Apart from financial services, Hong Kong is the platform for high-end professional services. Our world-class professionals in engineering, architecture, urban planning, surveying and consulting have the experience and knowledge to lead and implement world class infrastructure projects. As a real testimony to our position as an international financial, transportation and trade centre, more than 8 200 major Mainland China and overseas companies are now operating in Hong Kong. I am delighted that with the support from Invest Hong Kong, a number of promising Israeli businesses have also established their presence in our city recently. Indeed, the expansion of Israel-Hong Kong co-operation cannot be more relevant at this juncture, as Hong Kong is actively embracing innovation and technology as the new impetus for economic growth. In fact, I also see much potential for our two economies to join forces in harnessing the mighty power of innovation and technology in 21st century. Advanced I&T in all its forms is required in order to succeed in the future world economy. With our collective entrepreneurial spirit, business acumen, and shared commitment to scientific research and development, Israel and Hong Kong can forge new synergies in this field. Following the establishment of the Innovation and Technology Bureau some two years ago, we have allocated more than US$10 billion to upgrade our technological infrastructure, build a vibrant ecosystem for startups, and pool and nurture more technology talent in Hong Kong. We will be focusing on four areas, namely, biotech, smart city, Fintech and artificial intelligence and big data analytics. It helps that Hong Kong boasts a number of top-notch universities with strong research capabilities, as well as world-class information and communication technology infrastructure and the largest data centre cluster in the Asia-Pacific region. Our internet connection speed is among the world's fastest, and our mobile penetration rate, at 247 per cent, is among the highest anywhere – certainly on this planet. Among the many ongoing initiatives, we are establishing two research clusters in Hong Kong, one focusing on healthcare technologies and the other on artificial intelligence and robotics technologies. By developing these clusters, we aim to attract world-class scientific research institutions and technology enterprises to join forces with our local universities and scientific research institutions in conducting more midstream and downstream R&D projects. I am confident in this respect, let me add, because of our encouraging track record in this regard. For example, in late 2016, the celebrated Karolinska Institutet of Sweden opened its first overseas research facility for Reparative Medicine at our Science Park. Then, last September, the Massachusetts Institute of Technology opened its first overseas Innovation Node, providing entrepreneurial education and training for students and researchers from MIT and from Hong Kong as well. In addition, our country is very supportive of Hong Kong. Researchers in Hong Kong can have access to research funding available on the Mainland and renowned Mainland universities and research institutes have and will continue to set up laboratories in Hong Kong. Naturally, we welcome Israeli tech entrepreneurs, and talent to partner with Hong Kong in creating high-tech solutions for a smarter future, we also welcome Israeli innovative companies to make use of our world-class financial platform to raise fund. Our strong financial market will certainly play its part in promoting innovation and technology. For example, we understand that biotech companies face financial challenges, due to the long and costly journey inherent in turning biotech research into effective products and applications. We are keenly aware that biotech companies with promising developments in the works require substantial cashflow to get through the arduous, but necessary, approval process demanded by relevant authorities. With biotech and other sectors of the new economy in mind, the Hong Kong Stock Exchange introduced in April this year a new listing regime which allows pre-revenue biotech companies and companies with weighted voting right structures to list on the Main Board. The new listing regime also provides a route for issuers seeking a secondary listing in Hong Kong. We are developing Hong Kong into the preferred listing platform for emerging and innovative enterprises. We are also working relentlessly with industry stakeholders to further enhance Hong Kong's ecosystem for start-ups. Today, a new generation of disruptors is taking advantage of Hong Kong's favourable economic and cultural environment to create, innovate and enable tomorrow's economy. In recent years, our start-up scene has also taken off - not surprisingly, of course. According to San Francisco-based research firm Compass, Hong Kong is among the world's five fastest-growing start-up centres. With a growing number of private venture capital funds attracted by Hong Kong’s start-ups, as well as incubators, accelerators and co-working spaces now operating in Hong Kong, I am confident that the start-ups scene in Hong Kong will continue to flourish. Before I conclude, I also wish to highlight the exciting prospects for Hong Kong in the Guangdong-Hong Kong-Macao Greater Bay Area development, a national development strategy of China. Linking Hong Kong, Macao and nine cities in Guangdong, including Shenzhen, Guangzhou and Zhuhai, the Greater Bay Area counts a combined population of 69 million and a collective GDP worth US$1.5 trillion, which is comparable to that of Korea. Working together, the synergies to be brought about by these cities are obvious and tremendous. The world class financial services of Hong Kong, the vibrant tech sector in Shenzhen and the advanced manufacturing bases in the other cities in the area, enable the Greater Bay Area to have the combined advantages of the New York Bay Area and the San Francisco Bay Area. The Greater Bay Area has all it takes to become the international innovation and technology hub of China. In the coming quarter, two major mega cross-border infrastructure projects, the Hong Kong-Zhuhai-Macao Bridge and the Guangdong-Shenzhen-Hong Kong Express Rail Link, will be operational, further enhancing Hong Kong’s connectivity with the Greater Bay Area and beyond. With the Hong Kong-Zhuhai-Macao Bridge the travelling time from Hong Kong to Macao, Zhuhai and Shenzhen will be cut down substantially to less than an hour. A one-hour living circle will be created. And most of the cities in the Pearl River Delta Area are within three hours’ drive. Cities in Indochina, such as Hanoi in Vietnam, can be reached in about one day. And with the Express Rail Link, the journey time between Guangzhou and Hong Kong will be reduced to 48 minutes, and passengers from Hong Kong can easily access the over-20,000 km national high speed rail network connecting all major cities in the Mainland. Ladies and gentlemen, although this visit is a “first” in many ways, Israel and Hong Kong have established a firm foundation for collaboration over many years: the value of our bilateral goods trade exceeds US$4 billion annually; more than 30 Israeli companies operate in Hong Kong in a wide range of sectors; and last year, nearly 75,000 Israelis visited Hong Kong, up more than 16 per cent, year-on-year. Looking ahead, I am excited to learn more about Tel Aviv and Israel, in particular the vibrant innovation and technology scene. I also hope that you will come and visit us in Hong Kong very soon, to see the opportunities awaiting you, the opportunities for closer ties between Israel and Hong Kong. Thank you very much. Todá!